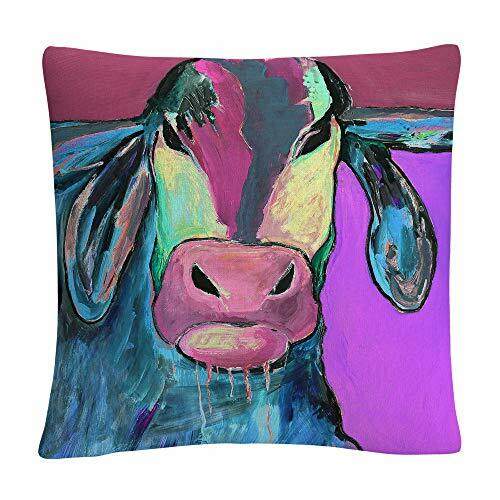 This decorative throw pillow features a colorful image of a Bull. Prominent colors: purple, pink, blue, light blue, black, grey instantly recognizable, the brilliant, saturated colors of Pat Saunders-White's animal paintings have established her as a national pet portrait artist. Pat brings an element of spontaneity, boldness, and humor into a genre that is often stiff and photorealistic. Pat's big 'Ah-Ha!' moment was when she painted her first animal. Fourteen year later, she still finds this an exciting niche. The first animal paintings in this new style and technique gave her a feeling of 'coming home' after a long journey. Pat participates in juried national shows and presents workshops in her home studio and various workshop venues. She donates her work annually to non-profit fundraisers. Whether it's your favorite classical art masterpiece or a fun, motivational phrase, trademark fine art’s decorative throw pillows bring creative comfort and style to any decor in your home or office. These chic and unique pillows feature a full color printed cover over a 100Percent American-made polyester pillow insert. The 16x16 square shape is perfect as a decorative accent on a bed, a statement piece on your favorite Armchair, or mixed and matched as your own curated collection on a couch or loveseat. With a variety of high-quality images, one or more of trademark fine art’s carefully crafted pillows will lend any room an aesthetic edge that everyone will notice. Important: avoid buying counterfeit products and transactions with unauthorized sellers. Look for our logo on the packaging for every one of our products. Trademark Fine Art is committed to providing the consumer with the absolute best price and value on our entire line of products, which we ensure by applying a rigorous quality control process. Trademark Fine Art is a registered trademark protected by U.S. Trademark law and will be vigorously defended.